Abstract. We use group velocities from earthquake tomography together with group and phase velocities from ambient noise tomography (ANT) of Rayleigh waves to invert for the 3-D shear-wave velocity structure (5–70 km) of the Caribbean (CAR) and southern North American (NAM) plates. The lithospheric model proposed offers a complete image of the crust and uppermost-mantle with imprints of the tectonic evolution. One of the most striking features inferred is the main role of the Ouachita–Marathon–Sonora orogeny front on the crustal seismic structure of the NAM plate. A new imaged feature is the low crustal velocities along the USA-Mexico border. The model also shows a break of the east–west mantle velocity dichotomy of the NAM and CAR plates beneath the Isthmus of the Tehuantepec and the Yucatan Block. High upper-mantle velocities along the Mesoamerican Subduction Zone coincide with inactive volcanic areas while the lowest velocities correspond to active volcanic arcs and thin lithospheric mantle regions. 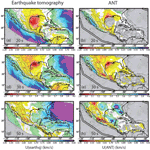 How to cite: Gaite, B., Villaseñor, A., Iglesias, A., Herraiz, M., and Jiménez-Munt, I.: A 3-D shear velocity model of the southern North American and Caribbean plates from ambient noise and earthquake tomography, Solid Earth, 6, 271-284, https://doi.org/10.5194/se-6-271-2015, 2015. 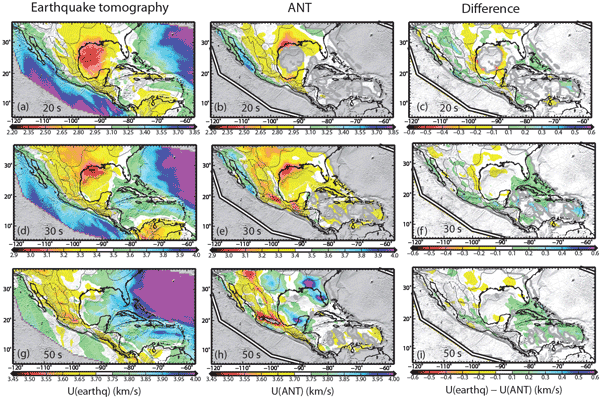 We compute a velocity model of the crust and uppermost mantle of southern North America, Mexico and the Caribbean. We use a recent technique based on "ambient noise" (or continuous seismic records) and a traditional one using earthquakes. Both techniques, together with the increased number of seismic stations in the region, allow us to obtain greater resolution than previous works. Some of its applications are to localize regional earthquakes and simulate ground motions.